MWD is considering a range of scenarios that could require the agency to limit deliveries and prompt mandatory rationing throughout much of the region this summer. Read more about the Drought 2015. GM Kightlinger featured in television news report about threat to Southern California water supplies from collapsed levees in the Sacramento-San Joaquin Delta. See the KNBC-TV report here. Colorado River Cooperation — Maintaining Lake MeadMetropolitan is working cooperatively with the Bureau of Reclamation and lower basin states to find long-term solutions to conserve this essential resource. Click here to read the GM’s blog. Read Metropolitan’s Annual Report for the 2013-14 fiscal year. Metropolitan’s annual report on achievements in conservation, recycling and groundwater recharge covers the July 2013 – June 2014 period. Ready to win your financial resolutions? Find out how to succeed in 2015. If you’re identifying 2015 — or even 2016 — as the year you make a major housing change, you’ll want to confirm that your credit behaviors are at their best. Buying a house is probably the biggest expense most of us ever take on in life. Your credit plays an important role in affording you access to the best terms available from your lender. If credit is on your list of things to improve next year, there are many options to tune up the ways you think about and interact with your credit. Knowing the smart solutions to improve your credit habits can take you far in the new year — especially with a big purchase ahead. Resolution to make: Check your credit report regularly to know where your credit stands, and to make sure you’re prepared when it comes time to buy a home. Consider your credit report the road map to all your credit behaviors: It’s important to know how your report will look to lenders and others when they see it for the first time. Resolution to make: To show others you’re using credit responsibly, keep your spending under control and in accordance with the budget you’ve set. Keeping tabs on your spending now will also help you benchmark how changes to your budgeting will affect how you spend after your home purchase. Resolution to make: Bring down the balances you’re carrying by upping your payment amounts above the minimum — this can also save you interest over the long term. You’ll want to keep that extra money in your pocket (and hopefully earning some interest) while you look for that dream property. Resolution to make: Seek out and accept new credit sparingly, so your credit-utilization rate won’t be seen as too high when applying for credit during your homebuying process. Lenders can be wary of applicants they feel might be trying to amass excessive credit and overspend. Resolution to make: Stay on top of your accounts to keep all your payments on time, every month — it’s even more important in the months you’re considering a big purchase like a home. It may be the most basic but most important way to show you’re consistently being responsible with your credit obligations. Challenging yourself by making it your New Year’s resolution allows you to take advantage of the months before your new home search begins to kick bad credit habits to the curb for good. You’ll want the peace of mind of knowing that when you discover that perfect listing, your credit is already in tiptop shape. Santa returns to SummerLane December 7th! 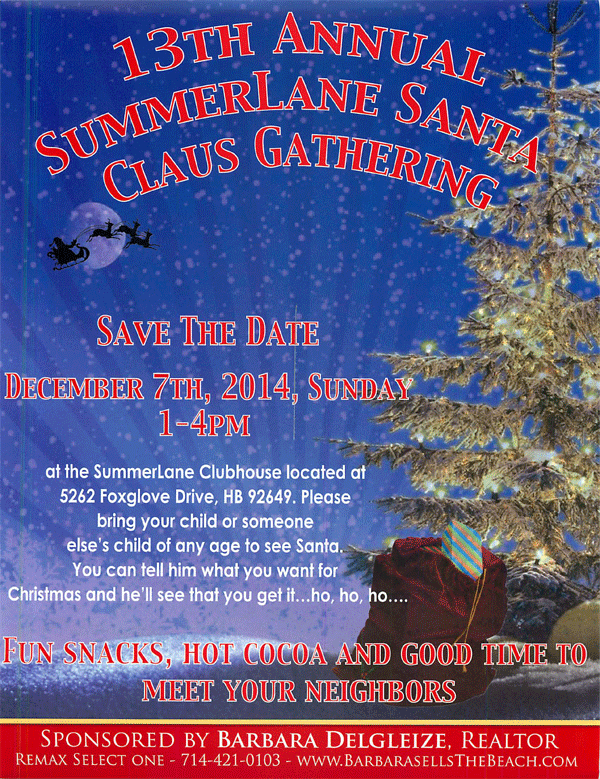 Santa is coming, Sunday, December 7th from 1:00 – 4:00 PM at at the SummerLane Clubhouse! Come visit Santa and bring your Christmas list! 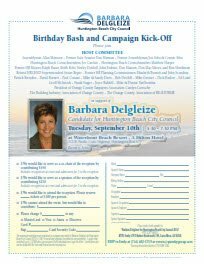 Please join Orange County Real Estate Community Professionals for a 9-Hole Scramble Golf Tournament in support of Barbara Delgleize for Huntington Beach City Council 2014. 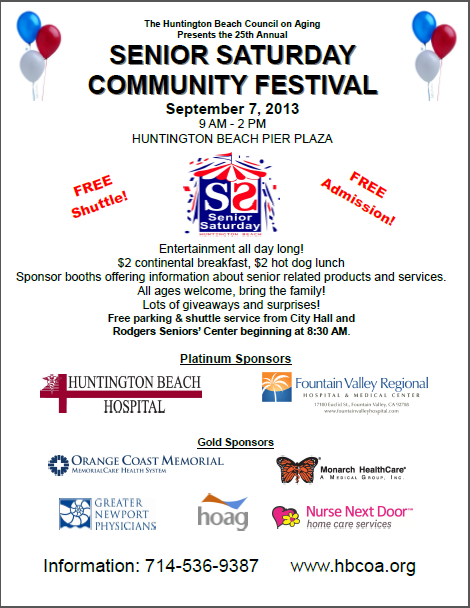 Come and join the fun and entertainment all day long on Saturday, September 7th at the Huntington Beach Pier Plaza. Free Shuttle and Admission. Sponsored booths will be offering information about senior related products and services. All ages welcome; bring the family! Lots of giveaways and surprises! Download PDF version of this flyer.